Ever hear much about the Spanish-American War? Most of the little that's taught about it these days focuses on Teddy Roosevelt and the Rough Riders. But there's a helluva lot more going on in that story than one battle on Kettle Hill. Even that battle got that name only because nobody wants to brag about fighting on "Washtub Hill." The other option for naming the battle was "I thought this was San Juan hill -- damn this lousy map" which didn't really work either. I was assigned a book to revise for a series on The United States at War, from Enslow Publishing. This assignment was a revision of an existing book by Robert Somerlott, so I wasn't starting from scratch. I was able to bring to the book some particularly interesting material about the Black Troopers, who were an important part of the American troops. The American army was not integrated in 1900, but there were regiments for men of colour, who were known as the Black Troopers. Two regiments of infantry and two of cavalry served during the Spanish-American War, as well as several men in the American navy, which was integrated. The war was part of what brought Teddy Roosevelt to the American presidency, and there are many connections between him and the Black Troopers. From the mustering in Florida, the landing in Cuba, and the battles on Kettle Hill and San Juan Hill, Roosevelt and his hastily created regiment of Rough Riders were out-performed time and again by the Black Troopers, who even shared their own rations with the unprepared new regiment. And in years to come, when Roosevelt was president, there was an incident that really takes more time to tell than I can today. I'll post about it in the future. 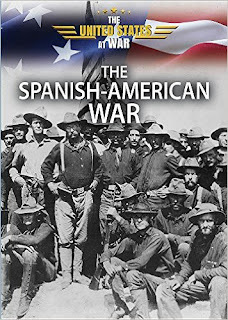 For now, ask your library to order in a copy of The Spanish-American War from Enslow.